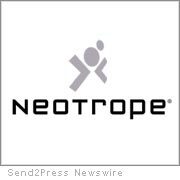 TORRANCE, Calif. — Neotrope(R), a brand identity, PR, and marketing firm established Jan. 1983, is donating $25,000 in free public relations and newswire services to worthy non-profit and charitable organizations to celebrate its 25th anniversary. Neotrope previously donated $25K worth of services in 2000, and $22K in 2005; and has provided discounted or free services to various non-profits for more than 20 years. Organizations may apply for this program starting today. “This is our way of supporting some of the numerous smaller organizations we feel need help to ‘get the word out’ about their efforts,” said Neotrope CEO and co-founder, Christopher Simmons. Neotrope, and its division Send2Press Newswire (www.Send2Press.com), have previously sponsored art benefits contributing to aid efforts for the homeless in Chicago, groups providing environmentally sustainable housing in areas of the world where disaster has left people without adequate shelter; and to orgs who raise money for Tanzanian AIDS orphans. Neotrope also sponsors entertainment events as diverse as Apple QuickTime shows, and both-coasts music showcases for indie bands, including the LAMN Jam series presented by the Los Angeles Music Network. Non-profit organizations may apply for free services starting October 1st, through November 12th, 2008. Organizations will be selected as applications are received, and the amount donated to each selected non-profit will vary. Half of the grants will be provided to California-based non-profits, who will receive additional promotional assistance through California Newswire(R). Additionally, all 501(c)(3) organizations automatically qualify for a 20% service discount. Finally, all qualified applicant organizations will be entered into a drawing to win a new One Laptop Per Child (OLPC) notebook which can be used for fund-raising purposes. Since 1983, Neotrope (www.neotrope.com) has been helping small-to-medium businesses and entertainment companies establish their brand and grow revenue. The Neotrope marketing team includes Christopher Laird Simmons, who is an award-winning designer, photographer, musician and digital artist. He is a member of the Public Relations Society of America (PRSA), Graphic Artists Guild, and ASCAP. Simmons has been widely interviewed by publications as diverse as Entrepreneur, Chicago Post Tribune, PCWorld, and TrendWatch. Other team members include accredited public relations professionals, working journalists and broadcast veterans. Neotrope is located in Torrance / Redondo Beach, California. Send2Press(R) offers best-in-class affordable Direct-to-Editors(TM) news distribution and alternative placement of news content to improve its “persistence” versus the traditional one-shot approach. In addition to sending news directly to working journalists, print and broadcast media, Send2Press places news into social networks and deep into search engines using proprietary ContextEngine(R) press release optimization technology developed in 1997. Cindy Holden has been an editor with the Neotrope News Network since 2004, and previously managed news content on Send2Press® Newswire. She is a part time photographer, and was born and raised in California.